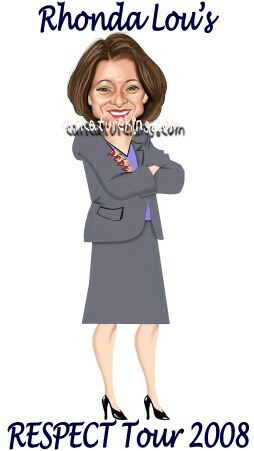 I wrote recently that giving a caricature as a gift can make you a hero in your workplace – everyone will think how clever you are and the recipient will really appreciate the thought. So here is a caricature with a different story. Rhonda Lou was doing a tour of company locations to roll out a new training program called “Respect”. (Top marks for the company for doing the training program!!). To mark her involvement, her boss thought it would be a fun idea to have a special T-shirt printed with her caricature image on it – a sort of a pun on a rock tour.